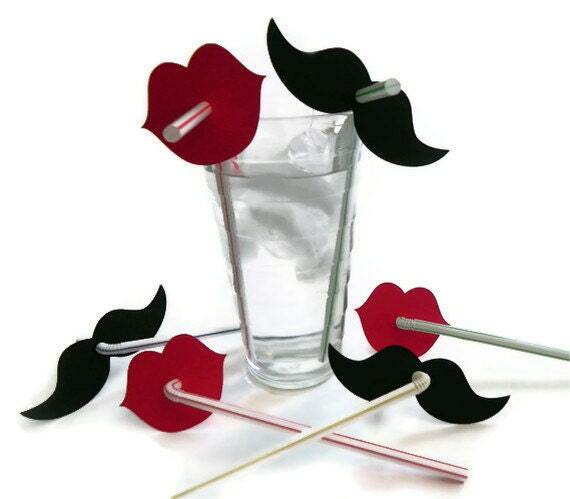 BabyBinkz Die Cut Paper Lip and Mustache Straws - Party Decorations or Photo Props! Take a sip, and pucker up or get stached! 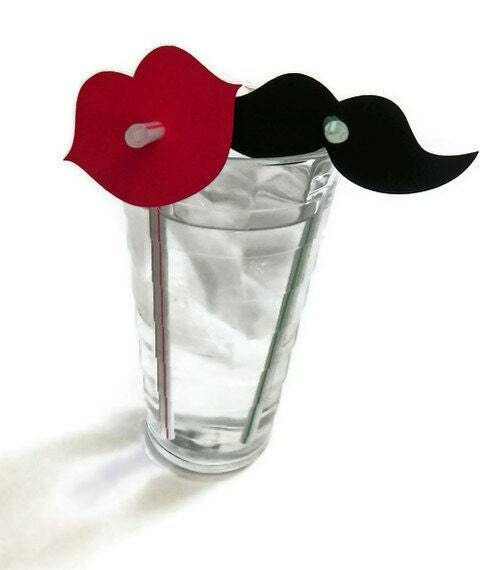 Let everyone at your next party pucker up or wear a stache when they take a sip of their favorite drink! This listing is for 20 Mustache and 20 Lip Straws cut from 65lb weight card stock. They measure 2.5" long and 2" high with a punched hole the perfect size to slide onto the included straws. They are the perfect size for photo props! To assemble your Lip and Mustache Straws, simply slide the lip or stache onto the end of the straw (it is designed to fit perfectly & snugly). Put into your favorite drink & pucker up or get stached! Need more than 40? You can order multiples directly off of the listing - or contact us for a custom listing! Need them quick? BabyBinkz currently has a 3-5 day processing time prior to shipping. Contact me prior to ordering to be sure we can meet your delivery expectations. Convo with any questions & thanks for looking! © All Rights Reserved by BabyBinkz.™ We retain copyright to all designs, images, text, and content in this shop. Any and all reproduction without permission is forbidden. Thank you. BabyBinkz accepts payment via Credit Card and PayPal. All products are handmade and generally have a production time of 3-5 days prior to shipping. BabyBinkz ships via First Class Mail (2-5 days) and Priority Mail (2-3 days) depending on order size and weight. For international orders, BabyBinkz ships via First Class International Mail with the USPS. Once your purchase is shipped, it will spend 3 - 6 weeks in transit. If you would like to upgrade your order to Priority International Shipping (usually 6 - 10 business days in transit) please message me and I can calculate the shipping costs for you. Any taxes, duties, VAT or customs fees are the buyer's (your) responsibility. BabyBinkz is unable to predict if there will be fees incurred and/or what these fees could be. Check with your country's international postal laws and/or postal regulations. BabyBinkz is not responsible for any lost packages or delays in your shipping due to the USPS. Please double check your address in Etsy - we are NOT responsible for lost packages due to incorrect addresses, nor will BabyBinkz pay extra shipping to re-send a package that is returned to us due to an incorrect address listed. If you need a package to be shipped priority, overnight, or would like insurance I can do this per your request for an additional charge. Contact me prior to ordering for a shipping estimate. Have no fear. I make all the products myself & I’m totally Type A and borderline OCD. But really, if you don’t love BabyBinkz products as much as that “new baby” smell, let me know within 30 days of your purchase. I love making our products and want you to love them too! We want to make you happy! So, If you are not satisfied with your purchase, please let us know ASAP (that’s as soon as possible for those not fluent in acronyms). We will process a full refund (minus applicable original shipping costs) for returns of unused, unopened products. Refunds will be processed upon return of products received within 21 calendar days of the original delivery date. Refunds will not be processed for any products that have been removed from their packaging. Sorry, but returns requested after 21 calendar days are destined for a lifetime next to your bowling ball in the guestroom closet.